The HPE StorageWorks MSL5026 Tape Library provides a high performance mission critical automated mid-range backup and restore solution using HPE StorageWorks SDLT 320 GB tape drives in a compact 5U form factor for direct-SCSI-attached and SAN environments. 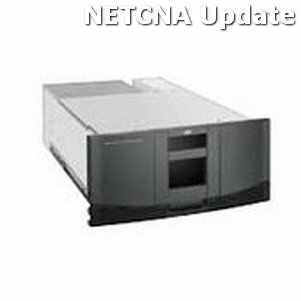 It provides unique investment protection with multi-unit scalability and a PCI backplane for future feature expansion. The MSL5026 defines a new segment in the mid-range segment with high availability features normally found on enterprise libraries. The MSL5026SL uses hot-pluggable SDLT drive carriers allowing drive replacement without interrupting backup and restore functions. These hot-pluggable drive trays allow for easy scalability of performance as well as provide an easy upgrade path towards future SDLT drive technologies. It offers 5.72TB (with 2:1 compression) of storage providing the highest capacity in its class in a compact 5U rackmount form factor. The MSL 5026SL has the capability for multi-unit scalability; up to 7 libraries can be scaled together in a virtual library for up to 40.04TB (compressed) of capacity. The first two modules are linked using Passthrough Mechanism which has the elevator mechanism for tape movement. The MSL5026SL uses hot-pluggable SDLT drive carriers allowing drive replacement without interrupting backup and restore functions. These hot-pluggable drive trays allow for easy scalability of performance as well as provide an easy upgrade path towards future SDLT drive technologies. It offers 5.72TB (with 2:1 compression) of storage providing the highest capacity in its class in a compact 5U rackmount form factor.